This week’s special Thursday podcast guest: Melissa Wehrle! 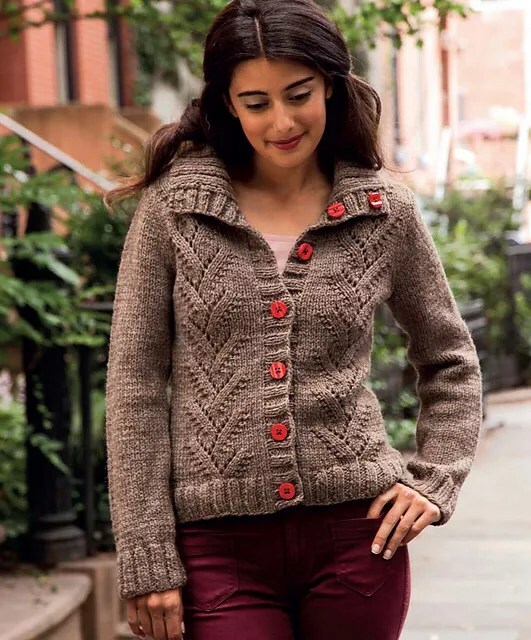 Melissa has a great new book out with Interweave called Metropolitan Knits, all designs inspired by Melissa’s hometown (for the last 15+ years), New York City! Each season is represented by rich colors, and beautiful designs named after different parts of New York! My Grandmother taught me how to knit when I was seven years old. However, I quickly lost interest making Barbie tube dresses and put down the needles for several years. My passion was renewed when I moved to New York City to study at the Fashion Institute of Technology, where I majored in Fashion Design and specialized in knitwear. Maria has worked in the fashion industry for nearly a decade, and has learned so much along the way. Currently she is a Senior Sweater Designer for a sweater manufacturer in New York City. In her free time, she designs handknit patterns for neoknits, a number of small yarn companies, and has been featured in Interweave Knits, Knitscene, and Twist Collective. This podcast’s giveaway: use Melissa’s keyword, and leave us a fun comment! Marly will pick TWO winners to receive Melissa’s new book! Where to find Melissa: Ravelry Group, Facebook, Twitter, and her website. Tuesday’s Podcast Guest: It’s a surprise!! Make sure you tune in!! I wish that I could be looking at the New York skyline right now while wearing the Washington Square sweater. Metropolitan Knits suits this born in Brooklyn babe. The photos bring to me Rhode Island NY style and the beautiful Manhattan skyline! New York City is one of our favorite cities to visit. My husband is from Brooklyn, so we try to fit in a Mets and Yankees game every few years. The New York skyline was wonderful to see from out hotel room in Queens when we were there this summer. My husband and I visited New York in 2010. We have very fond memories of the New York skyline and would dearly love to visit again one day! New York is a city I have always wanted to visit. The New York Skyline has to be AMAZING!!! This book looks amazing. I love the NY skyline. We visited NYC six years ago and I miss it. Melissa’s designs look amazing and really evoke the image of the New York Skyline. I heart New York – especially when I can go and see at least 2 Broadway shows in a day!! Thanks for another great show. Although I am not a strong knitter, yet, the patterns in Melissa’s book really make me want to challenge myself. Although I don’t see the New York skyline often the Philadelphia skyline will just have to get me in the state of mind! I would love to knit a hat with the New York skyline. I really enjoyed listening to Melissa speak about her new collection. I used to live in Brooklyn and from our stoop, we had a glimpse of the NY Skyline. The collection speaks to me on so many levels but specifically because I can envision many of the places the pieces are named for. I’ve been to NY only once, and would love to return there to see the New York skyline again. What a great city. Clever idea for a book! The NY skyline is certainly an inspiration. I will be seeing a lot more of the New York skyline now since my daughter is going to college there. I would love to make her something from this new book for her first winter in New York! The book is so fabulous., all the things I love to knit and of course I would love to knit while enjoying the New York skyline. Our family roots are embedded in New York City. I have only seen the New York Skyline from an airplane window – I hope I get to experience the sight one day closer up – I love Project Runway and would like to visit some of the fashion sites there and go to Mood fabrics and meet Swatch! Been envisioning the New York skyline this week with September 11th and all….thinking about how its changed and what it means to so many people. I would love to see this book in person and I would also love to see the NY skyline!! !